The Canadian Boreal Forest Agreement (CBFA) Secretariat recently launched its ‘On the Move’ campaign with the unveiling of a giant, travelling map of the boreal forest that’s touring Canada to showcase the unprecedented agreement between the forest industry and environmental organizations. 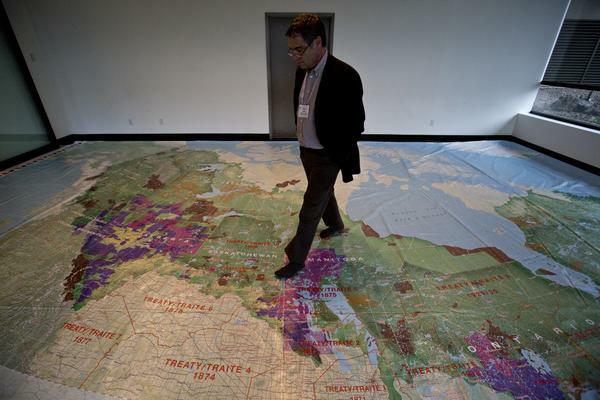 The CBFA and the Royal Canadian Geographical Society (RCGS) partnered to create The Boreal Project: A Uniquely Canadian Enterprise, which includes the design and creation of an eight by 11-metre map, as well as a program to educate school children and the public. Signed May 18, 2010, the CBFA ushered in a new era in conservation and resource management. Signatories to the CBFA include the Forestry Products Association of Canada (FPAC) and its 19 member companies, and seven leading Canadian environmental non-government organizations. It applies to more than 73 million hectares of public forests licensed to FPAC member companies across Canada.